Ahhh...what a great day at the game yesterday! Even if I do look a little like a lobster today. It was 92 degrees, but I didn't think I was getting much sun because of the cloud cover...oops! Today, I need to work on several things in preparation for Open House tomorrow night! Speaking of tomorrow, I'm so pumped to watch the finale of Bachelor Pad (even though I've already read the spoilers...drama!) and the season premiere of The Voice (welcome back, Adam!) But today, the hubs and I are off to do what we do best this time of year....a little Halloween shopping! I sure hope Target has all of their decor out now. They've been teasing me with empty shelves (with the exception of candy) for two weeks now!!! I love this newest resource because it is sooooo flexible! What kid doesn't want (or have) their own MP3 player!? Now, they can have one at school. This resource is an MP3 Pocket....what's really cool about it is that the blank screen is a fillable form so you can use it over and over and over again throughout the year. Just type a poem, song, or chant into the space and print. Students will then color and assemble their pocket. 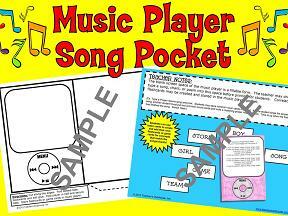 They can keep flashcards or game cards in the pocket that relate to the poem/song!! The idea that comes with the MP3 resource is one on common/proper nouns, but I can imagine using it for math facts (doubles, etc), animal classification (mammals, reptiles, etc), and so much more!! I'm excited for Bachelor Pad, too, even though I read the spoilers. I can't wait to see it unfold. I'm such a sucker for awful TV! Opps.. I hate typos! Thanks for visiting my blog! I love your title !